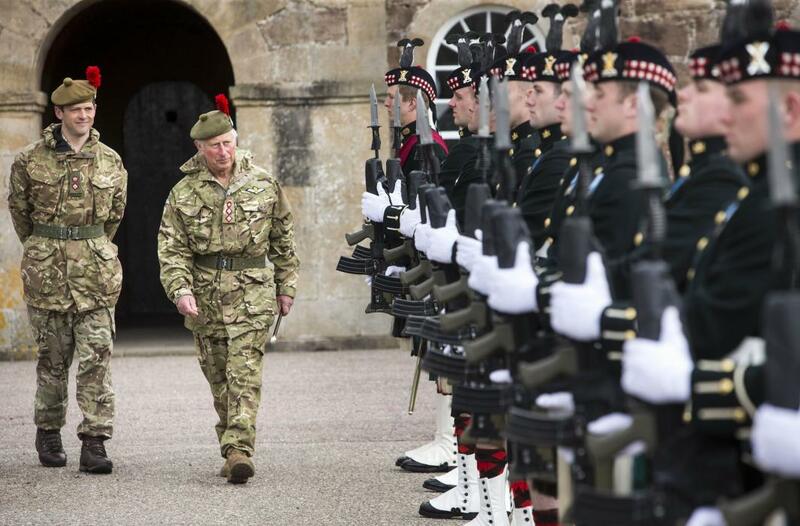 Today, The Prince of Wales, also known as The Duke of Rothesay when in Scotland, in his role as Royal Colonel, visited The Black Watch, 3rd Battalion, The Royal Regiment of Scotland (3 SCOTS) at their battalion home at Fort George, Inverness. The Duke arrived at Fort George by a Foxhound armoured vehicle -- a relatively new piece of military equipment for the Battalion, who are currently converting to a light mechanised infantry role. The Duke’s arrival was marked by 3 SCOTS Honour Guard and the Battalion Pipes and Drums. HRH was then introduced to soldiers and officers from 3 SCOTS and 7 SCOTS who introduced HRH to their families. The Duke wore his combat fatigues and the distinctive red hackle of The Black Watch. The red plume pictured in HRH’s tam o' shanter (also known as a beret) is a colour worn only by The Black Watch. The Royal Colonel then presented a range of awards to deserving soldiers who are working their way up through the military ranks. Among those being honoured were Sergeant Duncan Blake from Forfar, Angus, who received the cumulative campaign service medal for his 12 years with the battalion, serving in Iraq, Afghanistan and Northern Ireland. Sergeant Blake said: "It was a proud moment to get my medal from His Royal Highness. "I've never had any medals gifted to me before, I usually get them in the mail because I've been away. It's a great honour." The battalion's Commanding Officer, Lieutenant Colonel Alasdair Steele, said the Royal visit was a "huge honour". Lieutenant Colonel Steele said: "Not only does The Duke of Rothesay have a military connection to us as the Colonel of our regiment, which we hold really dear, he's got a deep personal connection. "It means a huge amount to soldiers and their families to meet him and to see him."